DEBAYTILATGIN, Ethiopia – Hulunayehu Belay’s family ekes out a living by farming a small plot of land at the edge of a mountain. Her husband, Leul Hunegnaw, supplements their income by working as a priest. For years, they struggled to put food on the table. Yet Ms. Belay kept having one child after another – in all, she had seven sons. Her first few children were born in rapid succession. “I had my children spaced very much close to each other, which affected their health and well-being as well as mine,” she said. Thirteen years ago, she and her husband decided that life could not continue this way. They decided to use family planning – a big deal for Ms. Belay’s husband, a prominent member of their conservative community. But they have no regrets. “We agreed that we need to use family planning to save our resources, educate and raise our children well,” said Ms. Belay. Ms. Belay’s days are often backbreaking. Every minute is spent performing household chores or working on the farm. She started out using injectable contraceptives, which last three months per injection, but the need to return to the health post every three months proved too difficult. She received counselling from a health extension worker – as community health workers are called in Ethiopia – and decided to switch to a longer-lasting method. 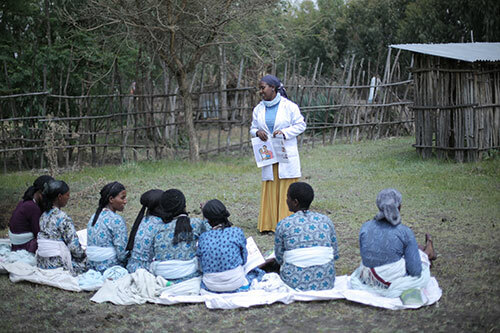 A health extension worker teaches women about family planning. First, she opted for a three-year implant, then afterward she chose a five-year implant. “If I want, I can get the implant removed and get pregnant again,” she told UNFPA confidently. During the same period, the fertility rate decreased from around 6 births per woman to about 4 and a half, according to the 2016 survey. Much this is due to the health extension programme, which brought family planning services to remote villages. UNFPA has long supported this system, which includes training extension workers to provide comprehensive family planning counselling. Extension workers even go door-to-door with information about family planning. To better meet women’s needs, a range of contraceptive options should be accessible. UNFPA is working to expand both access to family planning and the variety of contraceptives available. 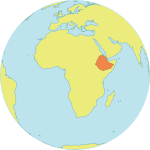 About one third of the reproductive health commodities and life-saving maternal health medicines required by Ethiopia are being provided through the UNFPA Supplies programme. Ms. Belay says family planning was liberating for her. She was able to focus on her children, ensuring they all went to school. Two of her eldest sons even graduated from college and are now working in the civil service. “My husband is also happy about this, as I now have the energy and time to support him in the arduous farm work,” she told UNFPA. She has also become a leader in her community, heading the local women’s development group – a volunteer network of 30 to 35 women dedicated to improving women’s health and fighting harmful practices. She uses the group’s bimonthly meetings to teach women about the benefits of family planning and the importance of giving birth under the care of skilled health professionals. Today, Ms. Belay is 45. It has been six years since she had her last child. She is considering trying to have one more – perhaps a girl this time. Some people have discouraged her because of her age. It might be risky, they tell her. But she knows the choice belongs to her and her husband. So for now, she is weighing her options and thinking about the future.